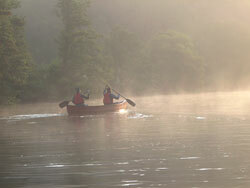 Early morning journey by Canadian Canoe. A gentle flat water paddle through the impressive Aigas Gorge to look for otters and feeding osprey as the sun rises... a truly memorable experience. Minimum age 12. Minimum of 4 people required for this trip to run - should we fail to confirm this number of bookings we reserve the right to cancel the session and offer money back or alternative date. 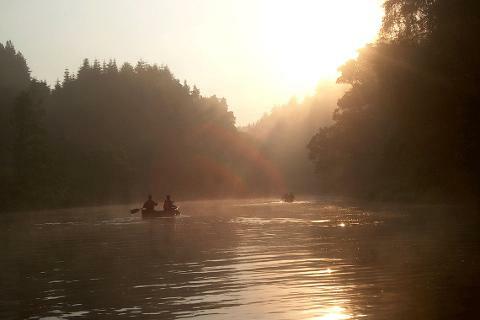 After a basic introduction to steering the canoes we will proceed in silence down the River Beauly on a short but stunning journey to experience river life at sunrise. Meeting Point: at the car park for the Aigas Fish Ladder on the A831 Beauly to Cannich road (3 miles west of the junction with the A862, 500m beyond the signed entrance to Aigas Dam when driving towards Cannich). We will leave one or two cars here and proceed up the glen to the start point. (We'll also send a map for additional information and contact details for your guide on the day once booked). Times: Meeting time depends on time of sunrise.